A Filipino choir highlighted the festivities as the couple which has led the Victory International Family Church for the past 15 years turned over the pulpit to a pair of successors. The Feb. 17 prayer meeting in a Royal Twin Hotel meeting hall was crowded with believers and guests from other Pattaya-area churches. All of them came to bid farewell to Fred and Dianne Doell, who’ve led the VIFC as head pastors. 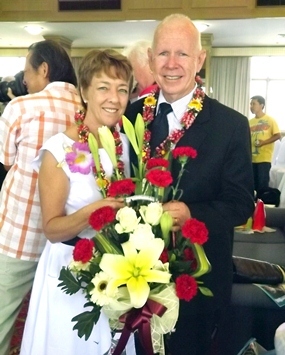 The new pastors, Rhonda and Allan Ward are welcomed to Pattaya. Australian couple Allan and Rhonda Ward take over for the Doells and were formally installed as reverends by Rev. 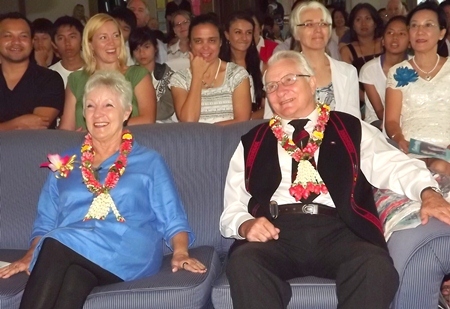 Jonathan Vikars who, with his wife Judy, lead the VIFC chapter in Chiang Mai. The Doells became well-known for their charity work, especially on behalf of children in Pattaya and Bangkok. Their most notable achievement was the founding of the Mercy Center. The Wards said they look forward to their new post with enthusiasm. They added they will do everything imaginable to lead the church with success and trust in God. Fred and Dianne Doell say goodbye at their farewell party.